Recently I had one of those days where, by the end, I had a powerful witness that Satan is real. I saw his hand in the lives of the people around me—contention, confusion, abuse of power, justice gone awry. Often there are evidences of this in the world, but yesterday the evidence was in my world. And I didn’t like the feeling. But just as that thought came, so did another: The power of God is just as real. As a member of The Church of Jesus Christ of Latter-day Saints—sometimes inadvertently called the Mormon Church—I know that God lives. 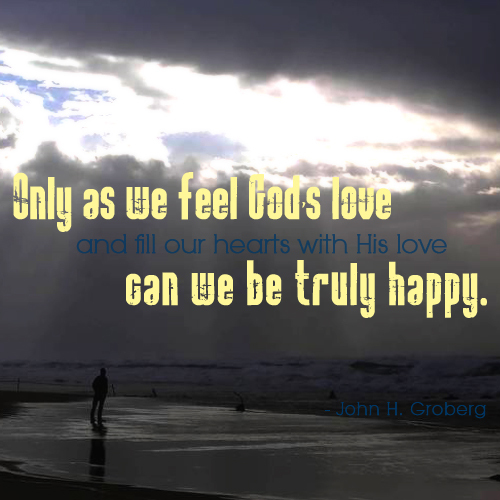 I know He is our Father in Heaven, and He loves us. And I know that through the Atonement of His Son, Jesus Christ, all things will be made right in the end. I live in a picturesque town in the mountains of Idaho. It’s easy to see the goodness of God in the beauty of nature. It can be more difficult to see His kindness in our lives—especially when the storms of adversities come. The Psalmist wrote, “The fool hath said in his heart, There is no God” (Psalms 14:1). It is a foolish man, indeed, who doubts the power of God and refuses His help in a time of need. The knowledge I have of God, His nature and His plan are essential when the storms of life are raging. When adversity seems to pile up around us—and around those we love—it is comforting to know that God is our Father in Heaven, and He loves us. He will always be there for us. In times of distress, we can turn to Him in prayer. We find answers to those prayers as we study the scriptures and serve others, becoming in tune with His Spirit. In the first act, we lived in a pre-mortal realm as spirit children of our Father. He outlined His plan for us, explaining His part and our part. In the second act, He would send us to earth to gain mortal bodies—with all of the joys and sorrows and everything in between—as a test to see if we would obey His commandments in all things, no matter what. He knew we would commit sin, and no unclean thing can dwell in His presence (1 Nephi 10:21 in the Book of Mormon: Another testament of Jesus Christ and a companion scripture to the Bible). So He sent His Son, Jesus Christ, to set the example for us to follow and to perform the Atonement, whereby we can be forgiven of our sins after we repent. The third act is the resolution of all things. If we have passed the test of mortality and proven ourselves faithful to God in all things, we can live with Him again. In the midst of trials and hard times, it is helpful to understand that there is purpose in all things. Heavenly Father has a plan for each of us, custom tailored to our personality and needs. That plan includes heartache and suffering as well as joy and gladness. The beauty of the tree was not just in its leaves and certainly not in its gnarled trunk, but in its sheer determination to fight through the bedrock of the cliff and grow into a forest king. That is the purpose of trials in our lives. They are refining fires that build our character and solidify our faith in Heavenly Father and His Son, Jesus Christ, if we allow them to do so. What Mormons know about God is this: He is real, He loves us and He has a plan for us. When we are in the midst of sore trials, and we can see Satan’s hand upon us, we just need to look up. Up to our Father in Heaven. He will always be there, and He will never leave us comfortless. He loves us with a perfect, pure love. His plan for us is perfect and pure. As we have faith in that knowledge, we can withstand the storms of life.